-180?? fisheye lens let you enjoy the world in the fish'eye. 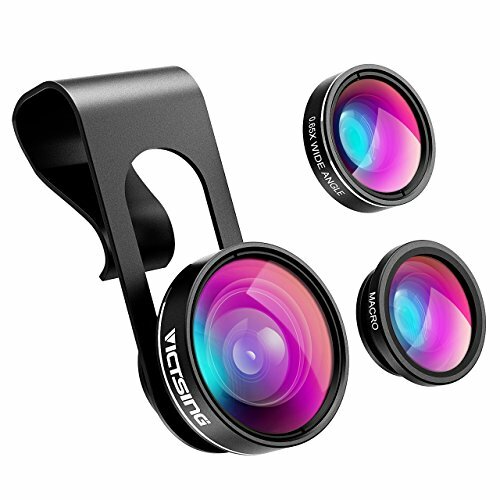 -Flexible Adjustment Design, you can adjust the lens to the right camera place of your cellphone. The macro and wide angle lens are screw together. Compatible with most types of mobile phones: the thickness of the cellphone is no more than 1.5cm and the distance between camera and the edge' of the cellphone is no more than 4cm. This product includes a 45 days money-back and 12-month, worry-free Guarantee! 【What You Can Get】1 x fisheye lens, 1 x 0.65X wide angle lens and 1 x macro lens, help you experience a funny world from your phone camera lens. Fisheye lens helps you feel an unrealistic fish eye world of images without black edges；Wide angle lens is improved from 0.67X to 0.65X, so you will get wider ranges；Macro lens lets you take pictures of a tiny object clearly in details. 【High Quality 】BTP (blue tape plating) Tech and High quality Japan optical lenses increase the light transmittance and insure the high quality image.There is no need to worrying about the service life of the camera lens kit. 【Easy to Use】It is very easy to install and remove because of the updated portable and detachable design. Please take off your phone case to help you take high quality photo at any time but with no harm to your phone and let your trip much easier. 【Wide Compatibility】Works great on most brands and models of smartphones, including 7/ 6s/ 6/ 5/ 5s/ 4 iPad Air 2/1 Samsung Galaxy Blackberry Bold Touch Sony Xperia Motorola and most android smart phones. 【Notes】Wide Angle Lens and Macro Lens are screwed together, please unscrew it before use. And make sure the thickness of the cellphone is no more than 0.6in and the distance between camera and the edge' of the cellphone is no more than 1.57in. Feel free to purchase and VicTsing provides 12 Month After-sales Service.